The European Union will not hold informal talks with the UK until it triggers Article 50 to leave, Germany, France and Italy have insisted. Together with the UK, Germany, France and Italy have the largest economies in the EU. Two ratings agencies, S&P and Fitch, downgraded the UK on Monday. A rating downgrade can affect how much it costs governments to borrow money in the international financial markets. What did they say in Berlin? 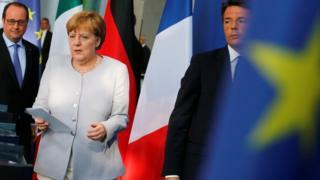 All three leaders voiced regret at the UK's vote to leave, with Mrs Merkel calling it a "very painful and regrettable decision". "We are in agreement that Article 50 of the European treaties is very clear - a member state that wishes to leave the European Union has to notify the European Council," Mrs Merkel told the joint news conference at the German chancellery. "There can't be any further steps until that has happened. Only then will the European Council issue guidelines under which an exit will be negotiated. "That means that, and we agree on this point, there will be neither informal nor formal talks on a British exit until the European Council has received the [UK's] request for an exit from the European Union." President Hollande and Prime Minister Renzi emphasised the need to process the UK's exit as quickly as possible and focus on the challenges facing the remaining 27 states such as fighting terrorism and strengthening the borders. "Our responsibility is not to lose time in dealing with the question of the UK's exit and the new questions for the 27," Mr Hollande said. "There is nothing worse than uncertainty." "On the one hand we are sad but it is also the right time to write a new page in European history on what unites us," said Mr Renzi. 'Go back home': racism "on the rise"
How does the vote affect expats? What is the latest from London? 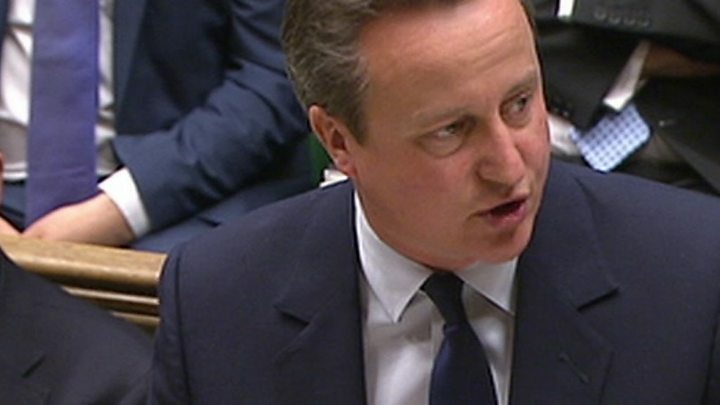 Prime Minister David Cameron confirmed in Parliament the UK was not ready to begin the formal withdrawal process. "Before we do that we need to determine the kind of relationship we want with the EU," he said, stressing it would be up to his successor, due to be chosen by the autumn, to invoke Article 50. Earlier, Chancellor George Osborne issued a statement to try to calm markets, saying the UK was ready to face the future "from a position of strength". But billions more dollars were wiped off the value of shares in Europe and on Wall Street as a result of market uncertainty. London's FTSE 100 share index was down 2.55% while Germany's leading index fell by 3%. The Brexit political fallout continued to divide the opposition Labour Party, whose leader Jeremy Corbyn was told by his deputy, Tom Watson, that he faced a leadership challenge because of his handling of the party's campaign to stay in the EU. David Cameron condemned racist and anti-immigrant incidents since the vote, saying: "We have a fundamental responsibility to bring our country together"
Wednesday: Second day of EU summit will feature breakfast talks between 27 leaders - Mr Cameron not attending. Talks focus on UK's "divorce process" as stipulated by Article 50, and Mr Tusk will "launch a wider reflection on the future of the EU"; press conferences in afternoon. Could Brexit lead to Grexit?